"Episodes of brilliant, imaginative acting by Steven Kimbrough." "Baritone Steven Kimbrough as Cervantes/Quixote has a strong presence and his vocal work makes the music sound much better than it really is." 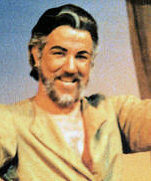 "Man of La Mancha is a triumph! Steven Kimbrough put in a winning performance." "His opera background and acting ability are beguiling. Caught in one mask too many, Kimbrough can give voice to a hilarious song like 'Gesticulate' and create an artful escape. Or he can twist the pedantic lyrics of 'Fate' into a rewarding listen." "The plus: Steven Kimbrough. For the role of the con-poet he has everything to offer: naturalness in acting, adaptability and good looks." "With Steven Kimbrough as Hajj, there is an acting singer on stage who possesses a delightful baritone voice and superb acting ability." "The Most Happy Fella' today is probably Steven Kimbrough who ran away with the show of the same name at its opening last night." "Steven Kimbrough is, like the role's originator Ezio Pinza, possessed of an operatically trained voice. His final solo 'This Nearly was Mine' had the resonance remembered of the early recording of the first broadway cast." "Kimbrough, speaking of marvelous voices, is an ideal Emile, romantically dashing, also a very skilled actor. And he belts his ballads right out of the bowl." "In the romantic songs of Romberg, Kimbrough's voice is pure liquid gold." "Steven Kimbrough plays Cyrano with dash, panache, and an exaggerated flair. Indeed he reminds one a bit of Ferrer in the role."